Just look at this snow and how beautiful it is. The branches were so heavy that we lost many large trees. The thought I had when I looked out my back door and saw the beauty and the weight of this ice and snow were, sometimes we bend, and sometimes we break. But we always have to stand steady. How strong are you? You can write the story of your life. It may not be easy, but you are the author of your life. You are in partnership as the author of your life along with the Almighty God. God knows your story, and you make the decisions that will frame that story. If you are like me, you probably think you are strong enough to withstand the worst of times. And you believe you will come out to stand steady in the end. But as I look back on my life, I realize I had to adopt an attitude of strength to keep from breaking. During the storm when you are writing the story of your life, you may not feel strong. 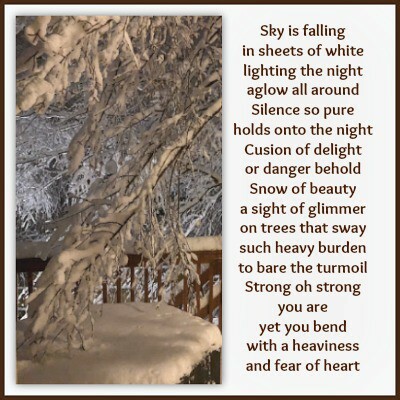 You may feel like the tree in the snow. The limbs are heavy with a burden, and they hang low over the deck. They could easily have snapped in two and tumbled. Some trees did but not the one you see here. This limb stood steady and hung onto the trunk for support. During the night as the snow continued to fall and the ice continued to freeze this limb came perilously close to breaking. The wind blew strong as the branch swayed back and forth. Is this how you feel at times in your life? Things get so scary, and you feel so burdened that you think you will break? I am painting a picture of extreme hardships in life. These hardships are what I went through many years ago. I know there are those in this world right now who are facing the same or similar horrendous problems and feel they can not make it until the morning when the sun will melt away the ice. When I faced the difficult times in my life, I saw myself as sturdy, but I was very frail. I prayed for strength frequently. I had a family to raise and needed to be their tower of strength. As I prayed, I saw myself as the trunk of this tree. I was the support that my family needed. As I look back on those years, I see how weak I was. My attitude and perception of strength did not come from who I am. I believe God gave me that attitude to stand steady. I wanted a person to lean on. I remember wanting to have support and someone to lean on. I wanted someone to share my experience with so they could tell me everything would be fine. 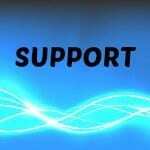 I couldn’t find this type of support because the things I went through caused pain when recounted. No one wanted to share in my pain. It wasn’t that they didn’t want to help or be a support for me. People couldn’t deal with the pain they felt for my children and me when they heard about my issues. I can’t blame them for that. I didn’t want to tell others about the details either after all the problems happened because of decisions I made in the beginning. I corrected those decisions but the damage had taken place, and I could not turn back the hands of time. I had to deal with the guilt, forgive myself and move on. So I was left alone. Or was I alone? At the time I felt like no one was there for me. I knew things were happening in our favor that I couldn’t explain. You can write the story of your life with the story of my life. What I mean is you can learn from me and write your story. That is what I do. I inspire you and give you strength. I look back on my life and allow you to improve yours. So what is my suggestion to you? When the storm comes how will you find your strength? Will you bend or break and will you stand sturdy? How will you do this? My first and only real suggestion is God. I prayed because I had no other way. I was so deep in the midst of the storm that I could not see my way clear. I hope that with this reminder as the sky is falling in sheets of white lighting the night you will see the glory of the Lord all around you. It is as simple as this. When you pray, remember that God has heard you. It is his will to take care of you and give you the strength you need to make it through another day. Then after you pray know, that you know, that you know he has answered your prayer. Even when you can not feel or see the answer you have confidence in your heart that he has responded according to the partnership he has with you to write the story of your life. God is good, and he is all things good. After you have prayed, acknowledge that he has answered your prayers only with the goodness he has promised. You may still see bad things happen but know in your heart that he is taking care of that too. And this my friend is one of my favorite scriptures that has carried me through all of life. When all is said and done. When you have prayed and given thanks for answered prayer, it is the time to stand in peace. God will put peace in your heart that will not make sense. His peace will guide you and guard you as you write the story of your life. I wanted people to support me and needed someone to lean on. That is not always possible. But God is still here for you. He will answer your prayers, give you strength and bestow peace in your life that no one can ever understand. His is the co-author who will help you write the story of your life and gives you the strength to stand sturdy. When the storm appears to break you down, you will find the strength in the Lord and his word. You may bend, but he will not allow you to break away from the trunk that feeds you. Hi, Laura and thanks for your post. I don’t know if you intended for this site to be for women only or just for anyone looking for a little inspiration but I gotta say that I enjoyed reading this post. Each of us does have a story to tell but most of us don’t even consider the thought of doing something like that. Our life is just our life with no thought of a God that knows every detail. This is part of a larger realization for me in that, as I look back on my life, even before I came to know Him and his Son, He knew me. ALL of me. Every nook and cranny, all the bad parts and all the good parts. He protected me then and He protects me now. He has given me peace when I have needed peace, forgiveness when I needed to forgive, supplied my needs when I was needy. Truly an amazing Almighty God. Writing our stories we do. Every decision, every action, they are all part of our story, all part of the life God knew we would live even before we were born. He wants to be part of that story. He stands at the door and knocks. Whoever opens the door and lets Him in, He will come in and eat with us. Amazing, always there with arms wide open. Thank you so much, again, for this post. Wayne, My site is for anyone who is in need. Because I am writing from my experiences it may appear that I am writing to females only. Not true. Actually, most of my followers are male. I so appreciate your comment. Your insight and love for the Lord are evident and your comment will help to add to this article. What you have said I believe is what people need. So again I say thank you so so much for stopping by and taking your time to comment. This was very inspirational. It seems to me like you see my life right and are sending me a message directly. We surely need to stand steady of risk being cut off. He said he knows the number of hairs on our head, which shows how deeply he cares for us. We are able to advise people who are going through the things we have gone through because of our experiences. And if there’s anything that tells you that God is working things out for your good, it is as you rightly said, PEACE. That peace that passes all understanding. I stand inspired and encouraged. Thanks. I write these inspirational posts for those in need. I am happy you came across this. It sounds like I may have written it for you. Thank the Lord you are here. Peace is the answer. He will give us peace in the storm and all we have to do is believe and have faith. Hmmmm this is inspiring. Life is about ups and downs, sometimes we feel we are all alone by ourselves. When challenges come we think we may not overcome and begin to lose hope. Yet God knows everything and he is ever ready to make a way and make us happy only if we trust in him. There is must be a story before a glory. God is the only way maker, only if we trust in him and lean in him. He will change our story into glory. Am inspired by your post, thank you. Ups and downs. Every person on earth has ups and downs. Some more than others but we all have the ability to overcome. With God, all things are possible when we stay in his word. Yes, he will change our story into glory. Thank you for reading and commenting. I am so happy you are inspired. This is my goal. Kari, thank you for reading even if you are not religious. I am not religious either. I am just a believer who knows the power of God and how he gave me peace while he carried me through the storm. Without him, I would not be where I am today. Thanks for this kind words. I am really inspired by your post. Most times, life throws a curve ball at us and we really don’t know how to respond. I always find comfort in studying the word of God because it gives me peace and calm. I know that friends and family may not be there for me always but God would never leave not forsake me. Yes, and yes, God will never leave you nor forsake you. He is your savior and your grace, your hope and your faith. He is all the things you need to make it through anything. Paul, as a seeker I will pray that the Lord will seek you out and draw you into his kingdom. Until that time I thank you so much for reading and encouraging my writing. You are a blessing to me. This is wonderful and utterly motivating. In fact, this write up here has the power to save someone on the verge of committing suicide, someone who is tired of life as it were. Knowing that you are sharing your own trying experience and perils make it easy to be confided in. Afterall, you have been there and walked this road together. Cheers. Thank you so much. Everyone who reads my work gets something different out of it. God directs those to me and my site who need to hear what he has told me to write. If you know someone who is suicidal I also have on a post, in particular, that may be of help. the link is. https://laura57.com/death-of-d… Please feel free to share it if you believe it will help them. Thank you. It was quite a powerful inspiration and an energizing one as well. I’m to stand tall and be strong no matter what I face in life and no matter the storms of life. I should tell myself that I’m not alone. God is with me and am not gonna get broken for any reason because am not alone. Life isn’t easy but with God, it will surely get better. You have interpreted this post so beautifully. thank you and do stand steady in the Lord. Hey Laura, Your article is so beautiful. I’m fortunate to read it in my early morning hours, feeling much refreshed. And, the Biblical quotes you have described from 1 John 5:14, Psalm 66:19, James1:17 and Philippians 4:7 are outstanding. Amen to all. May you richly blessed with the wisdom of the Lord. Looking forward to more such articles. They seem too original and describes your inner beauty. Akshay, Thank you so much. You are very kind and I am so happy to start your day with inspiration and scripture. Your comment is so encouraging to me. I feel it will also add to the post and help to encourage all who read. You have a wonderful understanding of what I am trying to say and the word of God. Thank you so so much. And thank you for sharing for anyone who may need this word to read. I feel your pain. I was once in a very dark place. I felt alone, weak worthless and not being able to do what I can to help my family. But I always remembered there is light at the end of the darkness. I always knew in my heart that this dark road that I was on will eventually fade away and give way to the light. Prayer and belief has kept me strong. Our Lord has helped me find peace and be strong through these dark times. Amen. I believe you do know how I felt and I believe you have found your way to the light. There is such peace in the word of God and peace in his redemption. Thanks for sharing this insightful article with your blog readers; No body owns my lifeI own the pen and i can write whatever i want to write about myself. The reason why many are depressed is because they allow others to write the story of their lives which affects their progress. Yes, you are the author to write the story of your life. Before God created you he knew the number of hairs on your head. He had a plan for you. It is he who helps you write that story. You have choices in life and you can choose to go a different road than what God has planned for you. He will not stop you but he will wait for you to return to him. Thanks for this lovely writeup Laura, this is wonderful. Taking control of one’s life can be a choice at times, a choice most would have a hard time making. We do like people to do things for us and it has been reflecting in most of our activities, this also will somehow reflect in our various personalities. According to your experience we do share the same attitude especially when I get to junctions and don’t know which way to go, I definitely turn to God for direction. You are so right in your assessment of mankind. We have to take responsibility for our choices and our life. 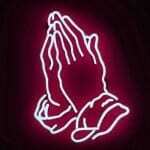 God will answer our prayers but we have to seek him out. He will not do all things for us without the individual first taking a step toward him. Thank you so much. I am so happy that you found inspiration and motivation in my experience and the word of God. this is a great article. many people are in this state of loneliness. mentoring and leaning on someone in time of down is all that is required to prevent or avoid many tragedy. everyone has at time or the other be in this position and as such I find your article very interesting and I thank you for sharing this with me. You are welcome. It sounds as if you are not a believer. That is OK as the Lord will seek you out when the time is right. In the meantime, you stand steady and grow from your experience and mine as well.